Tea parties are an excellent occasion for social interaction. Quintessentially a British past time, English tea parties date back to the mid-19th century when a hungry duchess knowing that dinner would be late, requested bread, butter and little cakes with her afternoon tea. It is an ideal event for people to gather for a chat, enjoy the warm brew of the tea and delight in partaking exquisite finger foods. If you feel you wish to host such a time honoured tradition, we have compiled a brief guide consisting of everything from food to the table to assist in holding an elegant tea party. No party is complete without an invitation that follows the style of the event. It should reflect how elegant and elaborate your party is. While an email or a phone call will suffice, it depends on how formal you want the occasion to be. A simple invitation can be on simple tea note cards, with the date, time and location of the party. It should be on firm card with a simple design with traditional Victorian afternoon tea invites featuring pictures of charming tea sets and English roses. Cover the table with either a white linen cloth or lace before the guests arrive. Depending on how many guests you wish to invite, you may consider hosting the party in the dining room, or for smaller gatherings, the living room. Use two large trays, one for tea and one for coffee and position the cups and saucers to the left of the tray. To make it easier for the guests to pour their tea (the job of the host is to ensure they do not go empty too), they should be positioned from the viewpoint of the person pouring with the left hand holding the cup and saucer. Traditionally, a tea party uses fine bone china to serve the food and drink the tea from. This sets the tone for the tea party with conventional tea sets consisting of a tea pot, cups and saucers and plates of various sizes. Most fine bone china sets come with elegant floral patterns. Many manufactures of fine bone china offer bespoke patterns and styles that will enhance the tradition of an English styled tea party. The food served at a tea party will mostly consist of sweet items such as cakes, cookies and cupcakes. The most traditional type of food served is jam, scones and clotted cream. However, some tea parties do consider those who do not have a sweet tooth by providing tea sandwiches such as cucumber, cheese and ham. Tea parties are mostly self-serving, though as a host you should be inclined to serve food to empty plates. 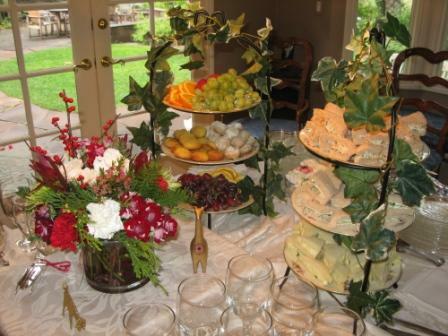 Set up the plates of food around the table to ensure that your guests can help themselves. Other things to consider when you host is to make sure the teapot is constantly filled up with boiling water and other tea etiquette practices such as avoiding clanking the teacup with a spoon when stirring. Follow these tips will aid in hosting an elegant styled tea party, it is presented successfully, and you may find yourself very popular when it comes to holding sophisticated events. Bill Turner is an entrepreneur and family man. He has a quiet spirit but enjoys being adventurous. When he’s not working or spending time with his family, he is marathon training.